Several years ago, I had a camping experience that made me appreciate the simple tree-pit snow shelter. During my primitive camping trip, my tent got a major tear in it. While the weather was just cold and not snowy, I was really not concern with it. I had camped in colder weather with just a tarp and sleeping bag, so I knew I could survive the tear. But as Mother Nature does, she produced a usual winter storm that produced a large amount of snow overnight. The next morning, I realized that I needed a better shelter than what I had. While the snow was an inconvenience, it was a blessing. Not only did it supply me with fresh water, it also provided me with the materials for a new refuge called a tree-pit snow shelter. To create a tree-pit snow shelter, one will need to walk around and take a look at their surroundings. What you are looking for is an evergreen tree that has a lot of low hanging branches that are safe. You do not want a tree with a lot of broken branches. These can come down and bury you in your snow shelter or pierce through your body while you are in the shelter. Once you have your evergreen tree selected, the next step is to dig out around the tree trunk and outward. Do not go beyond the width of the lower branches of the tree. These branches will provide overhead cover and moving past these branches will provide no protection. Continue to dig out the area until you reach the ground. Once you have reached the ground begin to stabilize the sides and top of the pit. This is done by packing the snow with your hands or shovel along the sides and on top of the pit. This will prevent the hole from caving in on itself and burying you. Next, cut several evergreen boughs that will be used as the floor for your shelter. Also, cut extra long boughs that will be used to create the roof of your snow shelter. Now that is done, you are ready to climb into your shelter. While this is a simple plan, there are few hints to take into consideration. First, this type of shelter will only work if you have a lot of snow and in this example that means at least 12 inches. 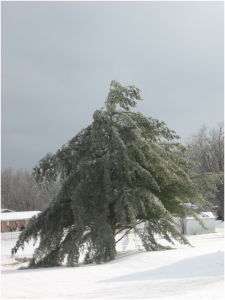 Next, only select evergreen trees, which have needles that can collect snow and can reduce the amount of additional snow that may enter your pit if it snows again. Lastly, only cut live plant material if there is an emergency. Following this last step will abide by the Leave No Trace principle.